Weekly Winner: Loving the Larb – Sans Carb! OK, I know… perhaps this title is a bit obscure, but much like this dish, it made me smile. Larb is a very popular style dish in both Laos and Thailand. It’s a spicy meal of ground meat which I suspect is usually served on rice. In this twist, the larb is served on a bed of roasted cabbage. 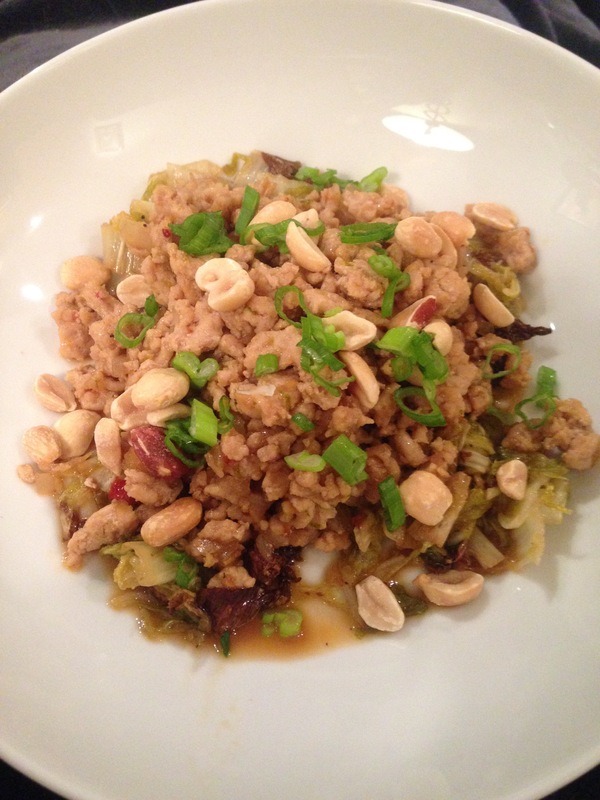 This is Spicy Chicken Larb with Thai-Style Roasted Cabbage and the recipe comes from Fine Cooking Magazine. It’s zippy, spicy, fresh-tasting and terribly addicting. And since there’s no carbs to feel guilty about (although I can honestly admit I’ve not regretted a single carb I’ve ever eaten!) you can keep on loving the larb! As the roasted cabbage takes longer than the larb (by a long shot) – I’ve put that recipe first. Position rack in the center of oven and heat to 425F. On a rimmed baking sheet, toss the cabbage with the oil, 1/2 tsp salt, a few grinds of pepper. Spread the cabbage out (it’s OK if the cabbage is mounded; it will shrink as it roasts), and roast, tossing every 10 minutes, until tender and most of the cabbage has turned golden brown, 45 to 50 minutes. Meanwhile, in a small bowl, whisk the lime juice, garlic, fish sauce, sugar, cilantro, and sambal oelek. Transfer the cabbage to a large bowl and toss with 2 Tbsp of the dressing and salt. Serve. Remove the pan from the heat, and add the lime zest and juice. Toss to combine, and season to taste with more zest, juice and salt. Serve the chicken over cabbage. Top with the scallions, peanuts, and chile rings, if using. There is nothing new in the main components of last week’s salmon dinner. I have made all of these things hundreds of times before — salmon, roasted veggies — many times they’ve even appeared on the same plate. But this dinner was different…dare I say “snazzy”. Much like the right accessory can liven up an old outfit, or a new throw pillow can add new life to your old living room, a different vinaigrette turned my ordinary “go to dinner” into an event meal. 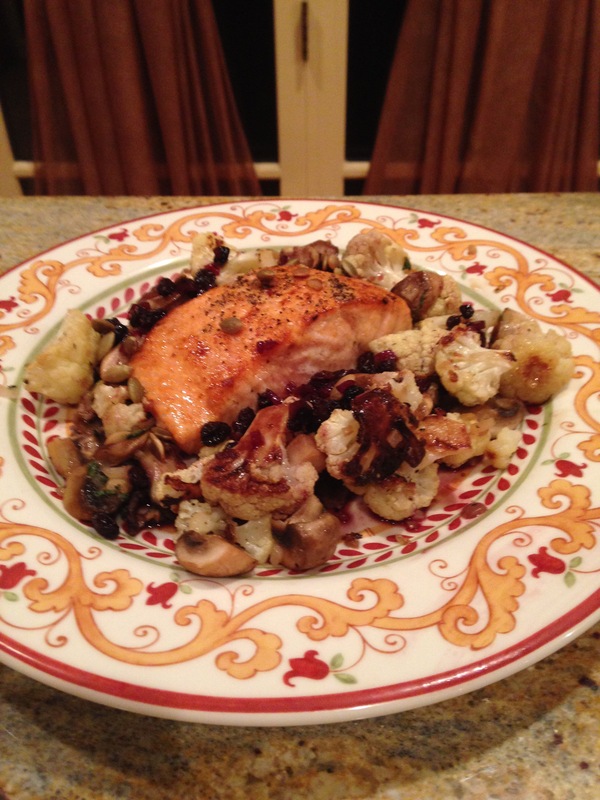 I’m talking about Oven-Roasted Salmon with Cauliflower and Mushrooms. See? Nothing new here. But oh, wait…. that zippy-tangy-slightly-sweet vinaigrette drizzled over everything hooks you with the very first bite and stifles any yawns you were anticipating with the meal. The recipe comes from Food Network Magazine and is neither complicated nor time-consuming. You’re doing what you’ve done a million times, roasting fish and vegetables. The only added work is whipping up the addictive dressing which actually takes about 7 minutes, tops. I’ve just been sitting here thinking about what else I can use that stuff on! 1/4 cup green pumpkin seeds, toasted (optional) – not really “optional” in my book! Preheat the oven to 450 degrees F. Make the vinaigrette: In a small heavy saucepan, bring the wine, currants, shallots, vinegar and brown sugar to a simmer over medium heat. Reduce the heat to low and simmer gently until the currants are plump and the liquid is reduced to 1/4 cup, about 5 minutes. Remove the pan from the heat and whisk in the olive oil. Season to taste with salt and pepper. Transfer to a small bowl. Prepare the vegetables: In a large bowl, toss the cauliflower with 2 tablespoons of the olive oil to coat. Season to taste with salt. Spread on a large rimmed baking sheet. Roast, stirring occasionally, until the cauliflower is tender and lightly browned, about 30 minutes. Remove from the oven. Reduce the oven temperature to 400 degrees F.
Meanwhile, heat a large ovenproof nonstick skillet over high heat. Add the remaining 2 tablespoons olive oil, then add the mushrooms and cook, without stirring, until golden on the bottom, about 4 minutes. Stir the mushrooms and cook until tender and well browned, about 4 minutes more. Stir the roasted cauliflower, shallots and garlic into the mushrooms and cook until the shallots soften, about 1 minute. Stir in the sage. Season to taste with salt and pepper. Return the cauliflower mixture to the baking sheet and cover to keep warm. Wipe out the skillet. Cook the salmon: Season with salt and pepper. Heat the same skillet over medium-high heat. Add the olive oil, then place the salmon skinned side up in the skillet and cook 3 to 5 minutes. Turn the salmon over; transfer the skillet to the oven and roast 3 to 5 minutes, or until the salmon is mostly opaque with a rosy center when flaked in the thickest part with the tip of a knife. Meanwhile, uncover the cauliflower mixture and rewarm in the oven if necessary. Transfer the salmon to a platter or four dinner plates. Spoon the cauliflower mixture around the salmon and drizzle with some of the vinaigrette. Sprinkle with the pumpkin seeds, if using (and you should!). Serve the remaining vinaigrette on the side. I love crispy chicken thighs, and I do truly, dearly love any meal that can be completed using only one pan or pot. Last night’s dinner gave me both of my loves on one plate. 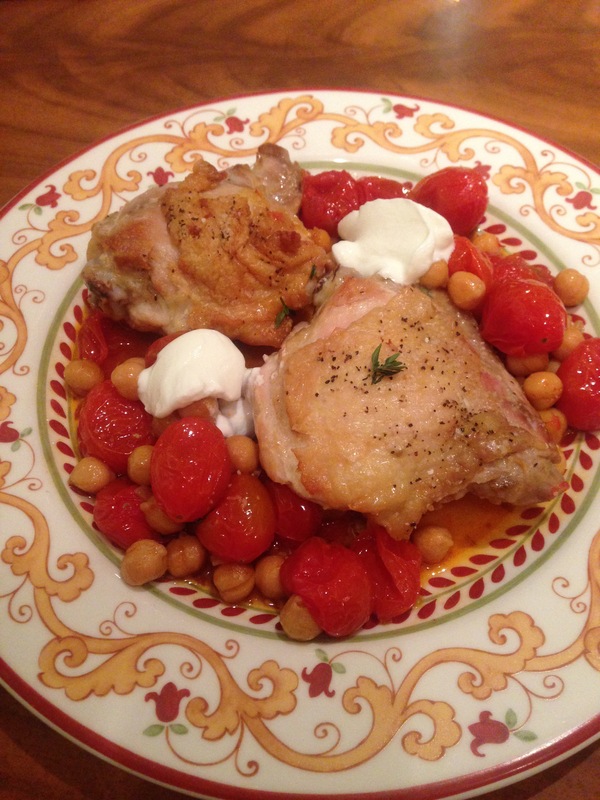 Crispy Chicken Thighs with Smoky Chickpeas made for an incredibly satisfying and healthy Tuesday night dinner. The recipe comes from Country Living and is about the easiest thing you can think of. Sear some chicken, mix everything up and throw it in the oven until its done. The real genius here though, is with the yogurt it’s served with. Just enough cool creaminess to really bring the dish together. It’s a simple dish – both in preparation, ingredients and execution. But sometimes simple is the most satisfying – as is this dinner. Preheat oven to 425°F. Heat oil in large ovenproof skillet over medium-high heat. Season chicken with salt and pepper. Cook, in batches, skin side down until skin is browned and crispy, 8 to 10 minutes. Remove chicken to a plate; reserve skillet. Add onion and garlic to reserved skillet and cook, stirring occasionally, until starting to soften, 2 to 4 minutes. Stir in paprika and cumin and cook, stirring, until fragrant, 30 seconds. Stir in tomatoes and chickpeas, and bring to a simmer. Season with salt and pepper. Nestle chicken into mixture, skin side up. Roast in oven until the internal temperature of chicken reaches 165°F, 20 to 25 minutes. Serve sprinkled with fresh thyme leaves and yogurt alongside. 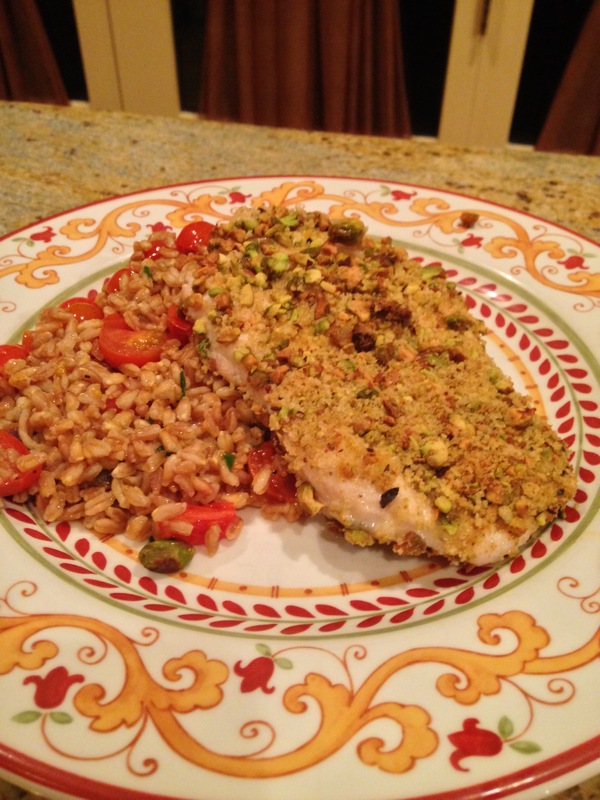 Weekly Winner – Turning Hipster and Going Green in One Single Meal. There’s not a whole lot I haven’t done with pork. After all, it is the Best. Meat. Ever (in my humble opinion, at least). And while I’ve applied a great variety of nationalities to pork including Thai (as this recipe is), I’m not terribly familiar with Green Curry Paste. I’ve used Red Curry Paste many times and adore it, but not the green variety. I also have to admit right up front that this incredible photo is not mine. It belongs to Bon Appetit where the recipe is from. Mine? Well, let’s just say it would not convince you to make this dish! I’ve got a way to go with food photography. So anyway, I decided to go with the professional model (mine, obviously was not covered in cilantro). Green Curry Pork Tenderloin is hard to describe. Its citrusy, spicy, creamy, and luscious all at the same time. 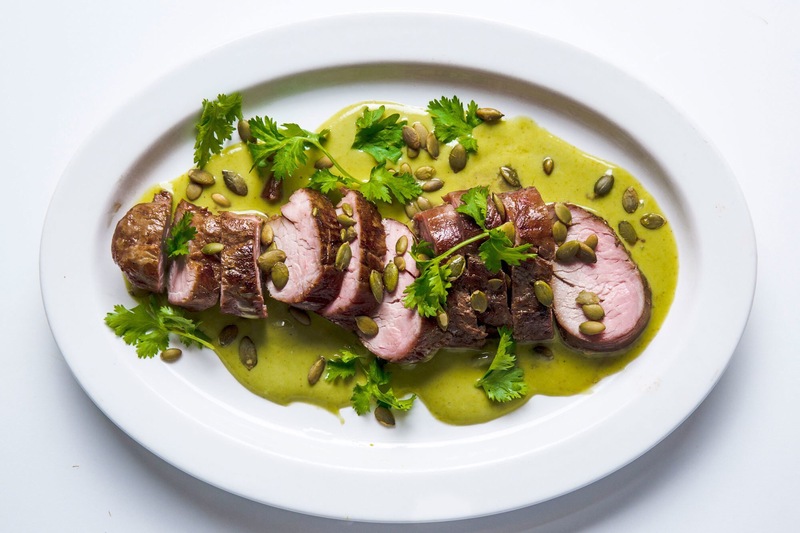 The pumpkin seeds add crunch and the sear on the pork adds a meaty, toasty note. By cooking the tenderloin at such a low temperature, the pork comes out juicy, tender, and evenly cooked throughout. So, now you know what I mean about “Going Green”… but what about the “Turning Hipster” part? Well, I surmised that this sauce was going to be tasty and would require a side dish worthy of holding on to said sauce. Because it’s a Thai Curry sauce, I immediately thought of white rice. But as it is still January, and I am still all aglow with healthy, nutritious resolutions I decided to think “outside the rice bowl”. The answer was obvious … it was time to try out Cauliflower Rice! For those of you not phased by the latest culinary trends, Cauliflower Rice is made by putting cauliflower in a food processor and pulsing it until it’s the size of rice. Then simply sauté it up and you have, what I found out, was an amazing substitute for rice. Don’t get me wrong – you still know its cauliflower but it serves the rice purpose beautifully. If you don’t like the taste of cauliflower you probably won’t like this unless you heavily flavor it with something else. Combine soy sauce, orange juice, maple syrup, and sesame oil in a large resealable plastic bag. Add tenderloin; close bag, pressing out air. Chill, turning once, 4–12 hours. Remove tenderloin from marinade and pat dry; discard marinade. Season lightly with salt. Preheat oven to 250°. Heat grapeseed oil in a large ovenproof skillet over medium-high. Cook tenderloin, turning occasionally, until browned on all sides, about 5 minutes. Transfer to oven and roast until an instant-read thermometer inserted into the thickest part of tenderloin registers 130°, 20–25 minutes. Transfer to a cutting board; let rest at least 10 minutes before slicing.